Vatnsholt is a beautiful farmstead that has recently been completely renovated. The view from Vatnsholt is one of the most expansive in all of Iceland, with clear view of landmarks such as the islands of Vestmannaeyjar, the Eyjafjallajökull volcano, and the well-known mountains of Tindfjöll and Hekla. 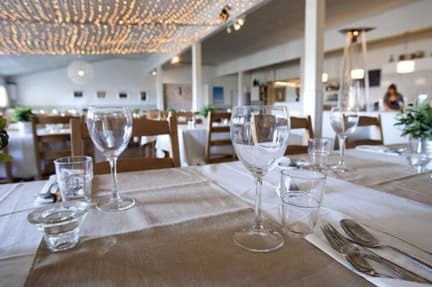 Vatnsholt is conveniently located 70 km from Reykjavik with an easy access from the main highway. The facilities include made-up beds with sheared or/and private bathrooms, large restaurant that gaze to have the food from the farm or from the nearest region to ensure the best quality. 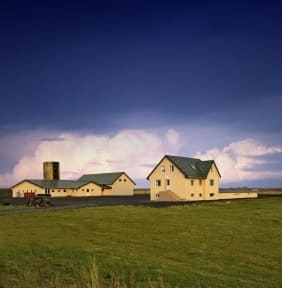 Staying at Vatnsholt offers a host of family-friendly activities. In addition to making use of the playground, both children and adults are sure to enjoy our eclectic collection of farm animals, which includes dogs, horses, rabbits, chicken, sheep and cattle. Bikes are available for rent, and boat rental and fishing in the adjacent Villingaholtsvatn lake is yet another activity to enjoy. Northern Lights are really a common guest in Vatnsholt in the winters, you can really well see them because of our location. We welcome you to our farm, and hope that you will enjoy experiencing farm life and our animals, as well as the exquisite beauty of the landscape.